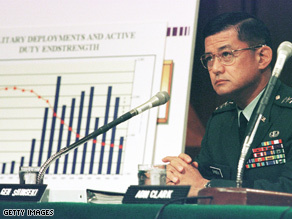 Shinseki is a former Army chief of staff. WASHINGTON (CNN) - President-elect Barack Obama will nominate retired Gen. Eric Shinseki to be secretary of Veterans Affairs, two Democratic sources told CNN Saturday. For years, Shinseki has been the patron saint of Pentagon critics who say the former Army chief's sage advice was ignored in 2003, resulting in too few U.S. troops being sent to Iraq after the invasion. Shinseki testified before the Senate Armed Services Committee in February 2003 that "something on the order of several hundred thousand soldiers would be required" to pacify the country. The comment infuriated some Bush administration officials, and he retired just a few months later. Shinseki has never spoken publicly about his testimony, which has often been cited by critics as evidence that then Secretary of Defense Donald Rumsfeld ignored the advice of one of his key generals. This is an excellent choice by President Obama! I am absolutely impressed by this choice. Brilliant! As we remember the anniversary of "Pearl Harbor" on Dec. 7, it seems fitting that Obama will announce the appointment of Gen. Shinseki as Veteran's Affairs Secretary. I pray that the VA will now be able to truly serve all who have served. For my dad and my son and all who have served and will serve I await for the full funding of the VA that Obama has promised. That we have reached the end of the era of 'deny, delay and defend' the poor service that our Vets have been subject to. And the hits just keep on coming, folks! Pick after pick of competent, intelligent, principled people to help Obama govern. Another great choice! I admired this man for sticking up for himself when everyone else was bowing to Rummy and Wolfie. I'm so impressed with President-Elect Obama's good choices. If my memory serves me well; Shinseki was the man who testified that Cheney made the call for our fighter jets to stand down from shooting down the "plane" that hit the pentagon on 911. Shinseki is an honorable man in my book for speaking the truth no matter how much Bush, Cheney, Rummy, Rove, and the rest of the rethuglican gang didn't like it. I think Gen. Shinseki will be a fine choice,I'm sure he will help all of us Veterans!!!! The question he answered was relevant to POST VICTORY Iraq,that really has nothing to do with the increase of troops needed during the war going on now,including the SURGE policy. I was hoping that he was chose for a position in the Obama administration. Every individual that disagreed with Bush was ousted and called names. The major problem with being a Dem or a Rep,,, you aren't a "individual" with individual thoughts and opinions. For those who chose not to go along and were mistreated by the Bush admin are truly strong because the were strong enough to "disagree". its actually smart to pick a general or a military person for veterans affairs when you think about it. Good move! My son a now former vet, in these wars, thought highly of him. A minority man in charge of a now mainly minority army. This man had the balls to stand up to Bush. Great choice. To bad he was BUSHED like the rest of us. One good decision after another. I'm so proud to have cast my vote for Obama!!! On the Pearl Harbor Day? The thought of Japanese-American taking care of American vets will bring tears to many eyes. Absolutely brilliant pick!. West Point and Duke graduate. I wish the Bush Adm. had listened to Gen. Shinseki. This whole surge crab would not have been an issue. Thanks God. The man is vindicated. Congrats to both of you PE Obama and Gen. Shinseki. GREAT CHOICE!!! He warned Bush and Rumsfeld about the out of control in Iraq after the U.S took over in 2003, and guess what he got....losing his job for speaking the truth!!! This is an honorable man who really cares about our VETS. Such a great choice. We've never had a president put together a team this impressive before, and the strong choices he's placed at positions like commerce secretary and the VA show how much emphasis he's placing on these offices that are often ignored. The wisdom of the Obama-Biden transition team continues to impress. Obama not only picked a very smart man, but he help vindicate an honorable man for "telling it like it is". Halelujah!!! May GOD Bless the Obama-Biden Leadership Team!